In their first season of existence, the Las Vegas Golden Knights have brought their own glitz and glam to tinsel town and kept the party going late. Later than anyone could’ve possibly imagined as a matter of fact. While it seems only fitting that the first major professional team based out of the gambling capital of the United States would spend an entire season beating the odds, it’s still one of the most unlikely sports stories in years. The Golden Knights added to a long and ever-growing list of firsts Tuesday when they became the first expansion team to sweep a playoff series in its inaugural season. That has propelled the Knights into the role of co-favorite with Nashville to win the Stanley Cup at 4/1 odds according to Betfair. Other leading online hockey sportsbooks including Ladbrokes (9/2) and Betway (15/4) have them facing slightly longer odds, but they pale in comparison to the 199/1 chance they had to win the Cup at the start of the season. One would’ve thought Vegas’ first-round opponents, the two-time Cup champion Los Angeles Kings and their experienced squad, would’ve put up a better fight. But there was no stopping the well-oiled Vegas machine. The sweep was just the most recent cherry on top of a sundae that keeps getting taller and taller for the budding franchise. Vegas opened the T-Mobile Arena on an emotional evening honoring first responders and victims of the horrendous mass shooting that occurred just a week before. The Knights won 5-2 against the Arizona Coyotes that night, and it marked the first time Vegas bookmakers would end up losing while the team succeeded. William Hill's U.S. branch dropped what was the biggest hockey decision ever for the sportsbook. Vegas would go on to win the Pacific Division of the Western Conference with an incredible 51-24-7 record. Whether those results were a product of incredible front office foresight, emotional momentum or just plain blind luck, they bely the shaky ground they sprung from. The franchise pieced together its first roster with an expansion draft that in retrospect would speak volumes about the depth of the league as a whole. Team owner Bill Foley told ESPN after the draft that expectations were low. Score some goals they most certainly did. What many analysts and so-called experts thought would be a traditionally weak expansion roster featuring a bunch of castoffs and misfits ended up scoring the fifth-most goals in the NHL (268). 25-year-old center William Karlsson led the way with 43 goals, 35 assists and a stellar plus/minus of 49. Veteran David Perron led the team in assists with 50 on a roster that sported 9 players with at least 10 goals. 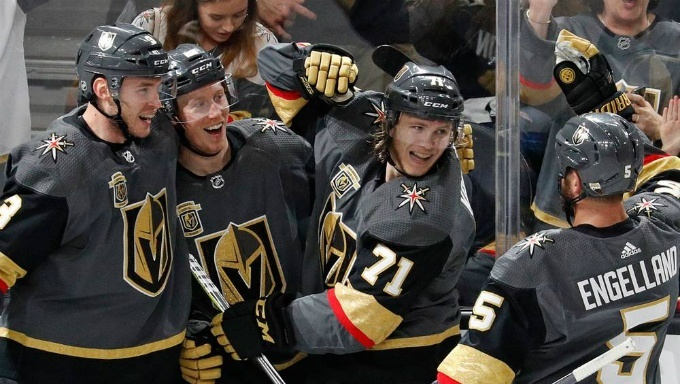 Sharing the puck, rapidly building incredible team chemistry, playing fast and putting up fantastic team defensive efforts wasn’t an issue all season long for Las Vegas. Veteran netminder Marc-Andre Fleury was in vintage form all season long as his career was given new life in Sin City. With a 2.24 goals against average, .927 save percentage and four shutouts, Fleury helped the Golden Knights give up the eighth fewest goals in the league (222). As the team continues to accumulate accolades, the success does little to faze Fleury who’s been there and done that plenty over the course of his career. For Gerard Gallant, who experienced a first of his own Tuesday with his first playoff series win as a head coach, Fleury’s guiding leadership comes as no surprise. Gallant believes the longtime Penguin brought Cup pedigree to a team that so desperately needed it. Aside from the Chicago Fire, who won the MLS Cup as an expansion team, there’s never been a team that’s taken home a professional sports championship in its inaugural season. That could all change if the oddsmakers are finally proven right and the Golden Knights end up making history. Bet against that at your own peril.